Spring is on the way to our apartments in Suwanee, GA. You notice many of the popular chefs turning their attention to asparagus. That's because garden asparagus is one of the first vegetables harvested in the year, so cooking with asparagus is a culinary tribute to the season. 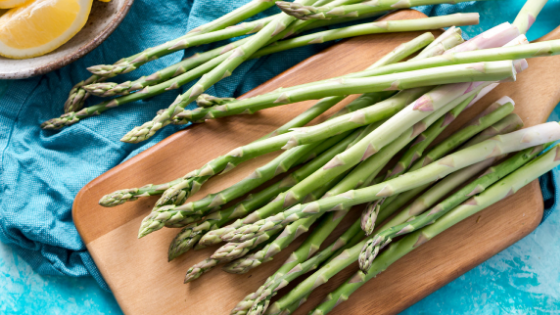 Did you know asparagus is a folk term, coming from the term sparrow grass? We think that makes it even lovelier! It's a flowering plant, and the new shoots are what appear as the familiar spring vegetable. And it makes a phenomenal pesto sauce for cold or hot pasta dishes. Here's a unique recipe to please the dairy-free crowd, and that everyone will love. Great news for plant power! If you’d like to make a fully greens-based pesto, now you can, thanks to this super-clever and amazingly real plant-based parmesan wedge. It’s stocked at Whole Foods and available in many of the best food stores in Angeles, and can even be ordered online. Trim the woody ends from the asparagus. Cut the stalks into 2-inch pieces, reserving the tips. Steam the stalks over boiling water, covered in a steamer for 4 minutes. Add reserved tips, and steam for another minute. Drain the greens well, and pat them dry. In your food processor, pulse the garlic, pine nuts, and salt to make a smooth, fine mixture. Add asparagus and oil and pulse the mix to the desired consistency, adding the cheese wedge at the end. Done! Your pesto can grace a hot penne dish but you can experiment with turning this into a cold salad, too! Simply buy 1 lb. dry penne, a small, plume-shaped pasta. Cook as instructed on the package, mix with pesto, and season with salt and pepper. Here's to Your Health and to Spring! The Pointe at Suwanee Station offers attractive kitchens with up-to-date conveniences to help make every meal a joy. Call (866) 682-3177 today to view the floor plans available to tour! Enjoy the ease and amenities that come with apartment living in Suwanee, Georgia at its best.